Once a splendid 19th-century spa resort with grand hotels and the wealthy and titled gambling fortunes in its casino, Aix-les-Bains is now a graceful, pleasant, more tranquil lakeshore holiday town worth a visit or a longer stay. As with so many therapeutic mineral-water baths, those of Aix-les-Bains were discovered by the Romans, and have been soothing aches ever since. 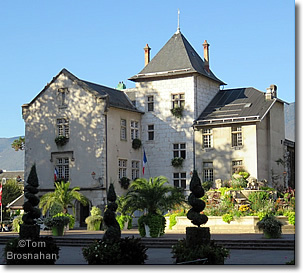 The 19th-century boom in rail travel and the popularity of spa resorts brought Queen Victoria, Emperor Napoléon III, and American tycoon John Pierpont Morgan to Aix-les-Bains. We suspect that they and lesser lights came more for the society, to see and be seen, than for the cure. The reasons to stop at Aix-les-Bains for one or more nights are clear: a temperate climate, graceful old trees, well-tended parks, and a manageable town center with shops, cafés and other services; a fine modern lakeshore with beach, promenades and marinas for motor and sail boats (not to mention parasailing); several Michelin-starred restaurants in the vicinity; and spectacular views of the Lac de Bourget and its framing mountains. Use Aix-les-Bains as a base for a driving or biking tour of the lake, or see it by boat—a wonderful vacation. Above, The medieval Hôtel de Ville in Aix-les-Bains: its back wall is left from a Roman temple. 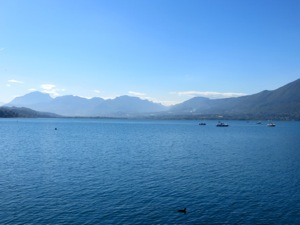 Below, View of the Lac du Bourget from the Petit Port of Aix-les-Bains.